Search for all "CD178 / Fas Ligand"
Mouse anti Human CD178 / Fas Ligand I-6060. Product is tested for Frozen Sections, Immunoprecipitation, Western blot / Immunoblot. 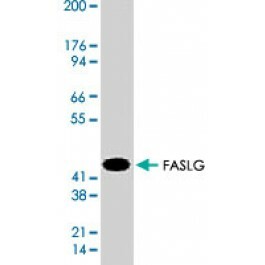 Recombinant protein corresponding to human FASLG. Mouse monoclonal antibody raised against a recombinant FASLG.